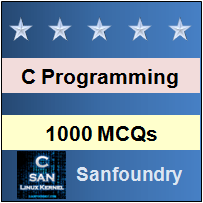 This set of C Multiple Choice Questions & Answers (MCQs) focuses on “Endianness”. Explanation: In little endian machines, last byte of binary representation (least significant byte) of a multi byte data type is stored first, whereas in big endian method, the first byte of binary representation of a multi byte data type is stored first. Explanation: In the code shown above, a character pointer ‘a’ points to an integer ‘i’. Since the size of the character is 1 byte, when the character pointer is de-referenced, it contains 1 integer byte. If the machine is a little endian machine then the value of *a will be 1, since the last byte is stored first. If the machine is big endian, the value of *a will be 0. 3. It is possible for a processor to support both little and big endian methods. Explanation: It is possible for a processor to support both little and big endian methods. Such machines are known as bi-endian machines. Explanation: The standard byte order (network byte order) for networks is big endian. Before transferring data on a network, data is converted to big endian. 5. Which of the following is not an example of big endian machines? Explanation: ARM processor is an example of little endian machine. Current generation ARM processor is an example of bi-endian machine. Power PC, Motorola 68K and SPARC are examples of big endian mahines. 6. Suppose we transfer a file written on a little endian machine to a big endian machine and there is no transformation from little endian to big endian, then what happens? Explanation: If there is no transformation from little endian to big endian on transfer of a file from a little endian machine to a big endian machine, the big endian machine reads the file in reverse order. 7. File formats which have _________ as a basic unit are independent of endianness. Explanation: File formats which have 1 byte as the basic unit are not endianness dependent. Eg: ASCII files. Other file formats have fixed endianness formats. Explanation: The output of the above code will be one when it is run on a little endian machine. This is because a little endian machine stores the least significant byte in the smallest address. Explanation: In a little endian machine, the least significant byte (right most) is stored in the smallest address. Hence the data “ABCD” will be stored in the form of “DCBA”. Explanation: Endianness is the sequential order used to interpret a range of bytes in the memory of a system.